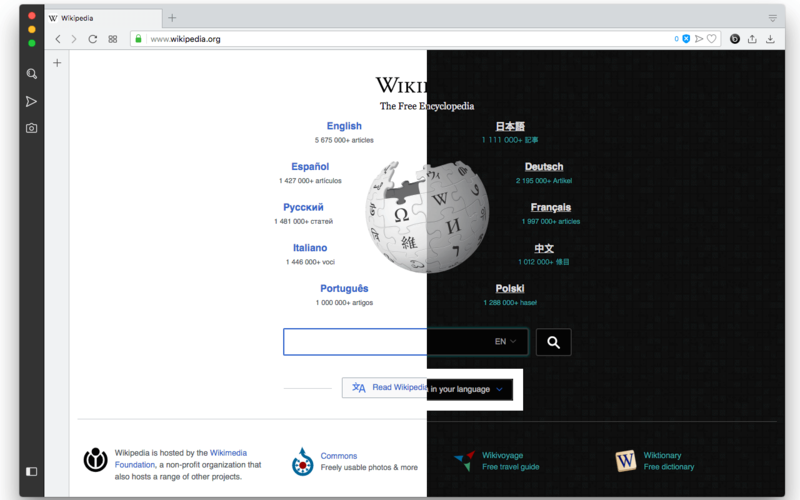 "Global Dark Style" extension adds a toggleable toolbar button to your browser to bring the dark view to all web pages. If a website has a built-in dark theme which you prefer over the one that this extension offers, you can simply add the website's hostname to the blacklist to prevent the extension from applying the rules. To add a hostname to the blacklist use the right-click context menu item over the toolbar button. Since there is no way to provide global rules that look good on all web pages, this extension offers per-site rules section. In this section, you can add additional rules just for a single hostname. Also, it is possible to append the global rules that are going to be applied to all hostnames. The extension can be globally inactive just by pressing the toolbar button once. The next click will enable the extension. What is the "Global Dark Style" extension and how does it work? This extension injects a few lines of CSS code to all web pages to convert their appearance to a clean dark theme. The extension can also inject user-defined CSS rules. There are two types of CSS rules a user can append. 1) Global rules which are going to be appended to the extension's default rules and will be applied to all hostnames. 2) Per-site rules that are going to be applied to the provided hostnames. Note that you will need to refresh the page when either of these rules is being edited for the changes to take place. This extension adds a toolbar button to your browser which is toggleable. Basically pressing the button once will disable the extension globally and pressing it one more time will enable the extension once again. If you are visiting a website that this dark theme is not working well on, you can use the toolbar button to temporarily disable the extension while visiting the website. You can re-enable the extension when the visit is over. However, if you are going to use that particular website often, it is recommended to either append custom rules to fix the theme's issues or add the hostname to the blacklist. All hostnames that are in the blacklist are not going to be touched by the extension. Basically, the extension does not inject the CSS rules in those hostnames. To add a website to the blacklist, simply right-click on the toolbar button and press the "Add/remove this hostname". You will get a notification indicating if the hostname is being removed from the blacklist or being added into the blacklist. How can I add multiple hostnames to the blacklist? For a single hostname, it is recommended to browse the host in a browser tab and then use the right-click context menu item to add it into the blacklist. This way all the tabs with the same hostname are going to be cleaned as well. But if you need to add multiple hostnames at once you can use the options page. There is a section for blacklisted hostnames. Add your entries to the list. Use a comma to separate the hostnames. Don't forget to use the save button when the list is edited. I've already added some CSS rules for a hostname. Is it possible to edit these CSS rules? Yes, open the options page and click on the entry to allow the extension to retrieve the data and fill out the form for you. Now edit the rules and press the "Add" button once. When you are fine with all the changes, press the "Save" button. Note that you will need to refresh the tabs for the changes to take place. This dark theme has some issues with a website that I am frequently visiting. Is there any workaround? First, you can use the review section of this page to report the issue. I'll see if I can fix the global rules to resolve this issue without affecting other websites. You can also go to the options page and define per-site rules to fix the issues. It is recommended to share your styling rules in this page for other users to use or comment on. I like the general idea of how this extension works, but I would like to adjust some of the colors. How can I do that? Use the options page and in the global rules section overwrite the rules to adjust the colors.